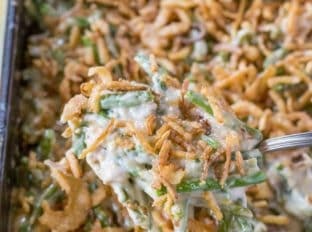 Easy Green Bean Casserole with green beans, mushroom soup, cheese and fried onions with just 5 minutes of prep. You’ll never go back to the canned stuff. 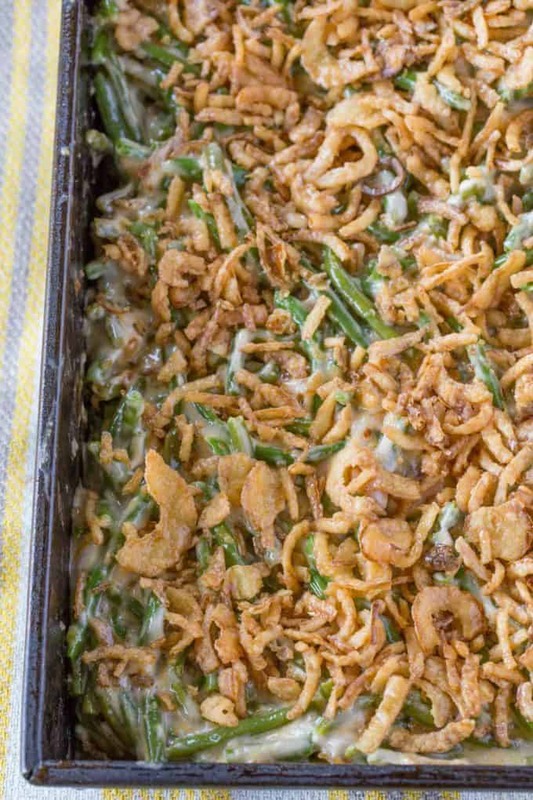 With your favorite Easter recipes like HoneyBaked Ham, Piccadilly Carrot Soufflé and Parmesan Garlic Crash Hot Potatoes, this green bean casserole is going to be the perfect addition to your holiday menu. 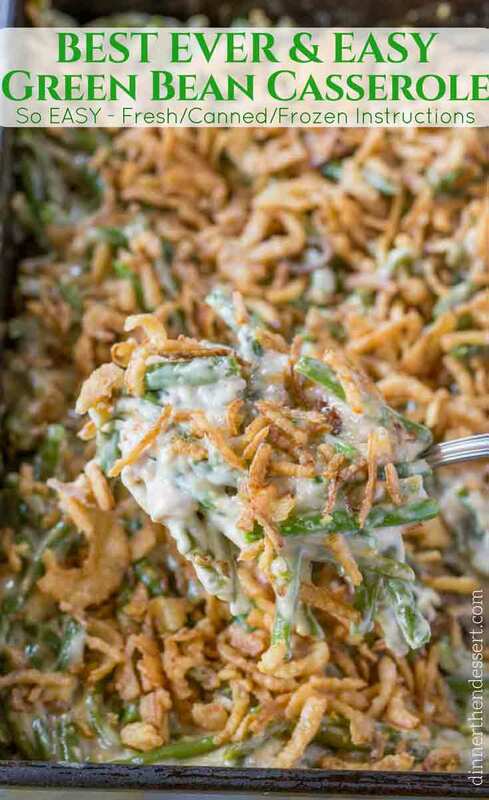 Green Bean Casserole has been a family favorite of ours for every holiday meal since I was a kid. Even now as we go to other family holiday get togethers with extended family, it always makes an appearance on the table. One reason only, it is SO DELICIOUS…easy AND kid friendly. Green bean casserole was invented by Campbell’s Soup in 1955 because it wanted to create recipes that could utilize it’s cream of mushroom soup. With the addition of crispy onions on top it became a hit around households and with kids because of the crunchy topping. Now, let’s discuss this recipe, because there are a lot of swap options available here even though we make this green bean casserole from scratch. Making a green bean casserole with fresh green beans isn’t as difficult as it may seem. Once you trim the green beans it only takes 5-7 minutes in your microwave to soften them as you would find in the canned variety. Why Use Fresh Green Beans? Well as with anything the less ingredients you have the more important it becomes to use the absolute best quality ingredients you can. Canned green beans are certainly an option (and an easy one) but fresh or frozen are preferred by me because I know those beans haven’t been sitting for long. The fresher the better. Why Use Cream of Mushroom Soup? This is a matter of nostalgia. There’s a version of the recipe out there that has a homemade cream sauce with large sautéed mushrooms. Certainly delicious, I’ve actually made it before and it is in fact delicious, but it isn’t that flavor we all grew up with. 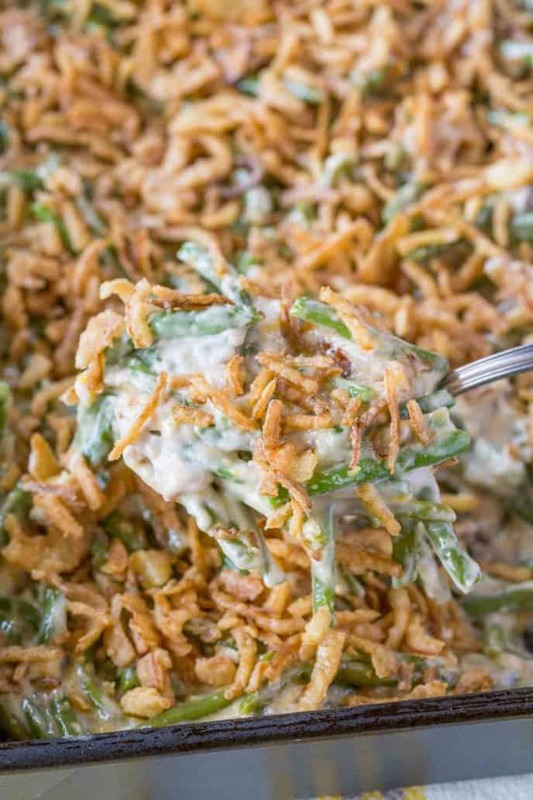 This green bean casserole recipe is like the kind you had as a kid but BETTER. The homemade condensed soup is a great alternative made with whole ingredients and the fried onions from the onion loaf recipe are the perfect topping. Using fresh green beans only has one downside, trimming. Do all green beans have strings? Yes, they do but they are not as tough as they used to be so simply trimming off the end with the stem is enough to make these green beans perfectly tender for you to enjoy. Should you slice the green beans in half? That is completely up to you, most people who make green bean casserole tend to just use regular canned green beans but if you’d like to slice them in half use a paring knife to carefully slice lengthwise down the middle. The cooking time will be decreased by about five minutes as the green beans aren’t as thick. The recipe calls for two cans of it. Pictured in this recipe is my homemade version (doubled) of cream of mushroom soup, but you can certainly use the canned variety. I make my homemade version and freeze it for use in these types of recipes. If using the homemade version and you’ve got it frozen, I’d add 1/4 cup of milk to it when gently reheating. Many years ago I started making Tony Roma’s Onion Loaf for us to enjoy at home. This was a mixture of onions, milk and pancake mix that becomes the most delicious crispy fried onions you’ve ever eaten. The only thing you have to do is once you’ve fried up the onions, use some of them in the mixture then top them after the green beans are done cooking for five minutes in the oven. I highly recommend enjoying these onions as the topping to your Green Bean Casserole recipe, but again the French’s Green Bean Casserole variety is a classic and would work out just fine too. 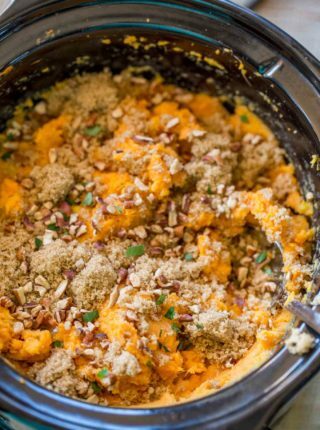 We LOVE this recipe made in the slow cooker. Double the recipe and cook on low for 5-6 hours before topping with the onions just before serving. Don’t mix in any of the onions of this version and don’t cook any longer once you top with the onions. Easy Green Bean Casserole with green beans, mushroom soup, cheese and fried onions with just 5 minutes of prep. You'll never go back to the canned stuff. USING FRESH GREEN BEANS: Trim the ends, put in a microwave safe bowl with a tablespoon of water and cover with wet paper towel and microwave for 5-7 minutes. Drain and pat dry. USING CANNED GREEN BEANS: Drain well and pat dry, no need to microwave. In a large bowl mix the green beans, mushroom soup, cheddar cheese and 1/3 cup of the fried onions, then add it to a baking dish. Top with remaining fried onions and cook an additional five minutes before serving. Curious how the recipe does without any milk? Hello there. Im just curious what is your opinion on size glass baking dish? My thought was to cut this recipe in half were having a rather small thanksgiving this year. I though tour option would be best! Thanks Sabrina!!! I used a 9×13 baking dish for this recipe but if you’re cutting it half, just use a smaller size. Enjoy and Happy Thanksgiving! Would you make the fried onions the morning of, or could these be made the night before? The morning of, the night before would make them too soft. Very nice dish. I love green bean thank you. In what size quarts should I put this in? I used a 9×13 pan for this recipe. Enjoy! 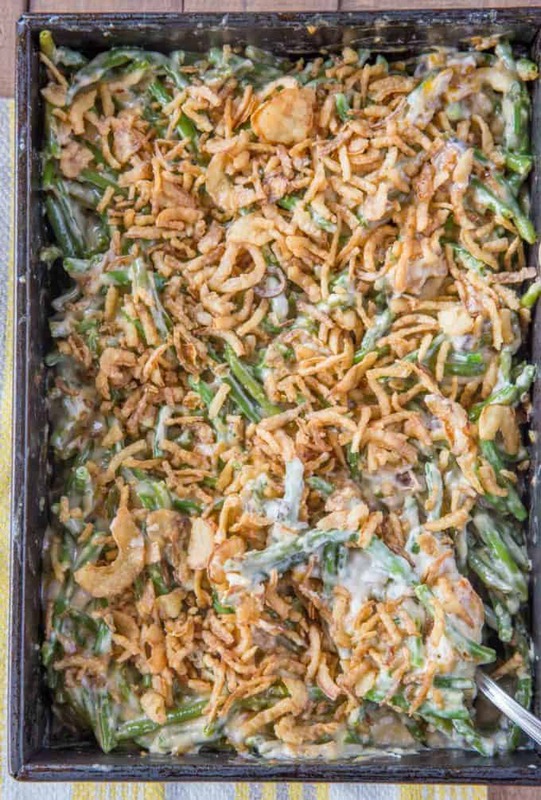 Can this green bean casserole be made in advance a day? I am not seeing the link to your homemade cr of mushroom soup?? Where is the homemade mushroom soup recipe please ? 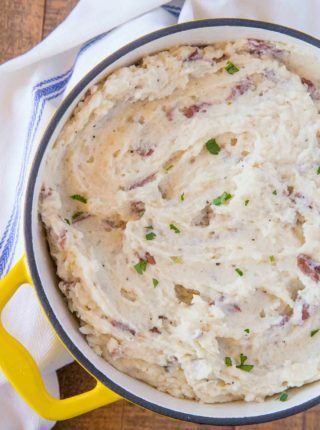 I’m SO bookmarking this for next Thanksgiving!! Yummy!! Fresh green beans make all the difference! I could eat this as a meal in itself!